CAPE TOWN, South Africa (CNS) — Catholic aid workers from Niger’s poorest areas have moved north to help migrants in Agadez, the city that serves as the jump-off point for the trek across the Sahara Desert toward Europe. “We need to help people understand what they are getting into, and provide them with alternatives,” Caroline Agalheir, Catholic Relief Services’ program manager in Niger. About 90 percent of the migrants from West and Central African countries who pass through Agadez are men. Those who attend the training classes are able to teach others their newly acquired skills as well as set up shop, Agalheir said. Niger is a vast, largely desert nation to the north of Nigeria. Most of Niger’s 20 million people live in the South of the country, which is at the bottom of the U.N.’s Human Development Index and faces severe malnutrition and other poverty-induced health problems, Agalheir said. Agadez, a “sprawling city with beautiful architecture, sun-dried mud homes and a mosque built in the 1500s,” was an important tourist hub in the Sahara, said Michael Stulman, Catholic Relief Services’ regional information officer for West and Central Africa. But with porous borders and increasing instability in neighboring countries, tourism has dropped off dramatically, he said, noting that residents who in the past had worked in tourism-related activities are now involved in smuggling people across borders. More than 180,000 migrants crossed the Mediterranean from North Africa to Italy in 2016. Since late 2015, the European Union has been working with the governments of Niger and other African countries to curb the crossings. The authorities “hope what they are doing will reduce the number of migrants but, in fact, it just makes the journey more expensive and more dangerous” for those who are determined to go, Agalheir said. Instead of using main roads, trucks carrying migrants try to escape police detection by going through unfamiliar parts of the desert, often getting lost or running out of gas. Many people die of dehydration, starvation and exposure, she said. For centuries, Agadez has played host to people on the move and “migration is a normal part of life in this region,” she said. People from Senegal, Guinea-Bissau, Mali, Benin, Nigeria and other countries routinely move to another city or country to work for some months of the year. “Some from farming areas plant at home for four months and then move to find work where there is a different agricultural cycle,” she said. The desire to move has been exacerbated by climate-induced changes to agricultural patterns, “and we are looking for ways to enable farmers not to give up,” Agalheir said. Groups of women in Agadez have asked Catholic Relief Services for lessons in how to dry food so it can be stored effectively, she said. “A woman with a baby on her back told me with great pride what she and other Christian and Muslim women in her group had learned about drying carrots, onions, green beans and peppers, and packaging them into convenient quantities to use at home or to sell,” she said. 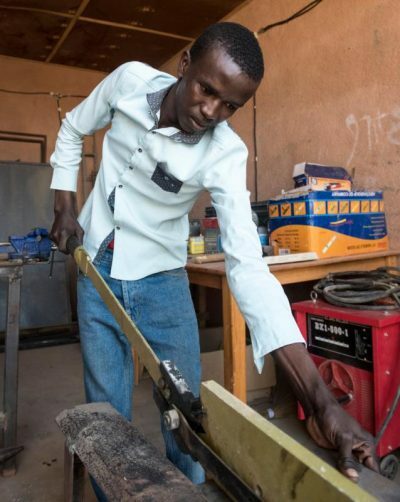 Locals as well as migrants in Agadez have “different backgrounds of education and skills, which makes it tricky to decide what kinds of skills training to offer,” Stulman said. “At present we are focusing on those without professional training and plan to extend the types of skills training we offer,” he said. “Our haircutting courses are popular,” Agalheir said, noting that migrants are given starter kits to take to their home countries in the hope that they will generate an income for themselves and their families. Also, “it doesn’t take a lot to set up an informal restaurant when you’ve been taught how to prepare food and have some equipment,” she said. For many women attending the training courses in Agadez, “this is the first time they have had an opportunity to generate their own income,” Agalheir said. With social cohesion a major focus of Catholic Relief Services’ work in Niger, where more than 90 percent of the population is Muslim, training courses in Agadez always include Christians and Muslims, Agalheir said.